The Palace of Congresses and Exhibitions of Galicia will host this open space for professionals focused on the phenomenon of the Camino de Santiago. Two years after its first edition, celebrated in 2015, we already know the date of the Fairway, the II Forum of the Camino de Santiago. 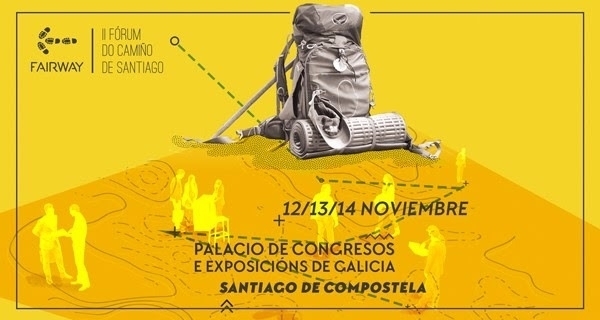 It will be between Sunday 12 and Tuesday 14 November at the Palace of Congresses and Exhibitions of Galicia, in Santiago de Compostela, which will house a space completely focused on addressing the phenomenon of the Camino de Santiago. Fairway was born of the private initiative of several companies related to the tourism, counts on the patronage of Correos and the collaboration of Paradores. This meeting point around the Camino de Santiago offers three different proposals to the participants; on the one hand, a conference with papers and round tables; second, a professional fair where exhibitors can show their products and services to the public and finally a workshop space in which professionals can meet and network. It should be mentioned that in the first edition participated in the meeting up to 100 companies, 50 speakers and 50 other exhibitors related to the Camino de Santiago; 25 national and international tour operators related to the Jacobean routes also met.